kallymorse on How much do you know about Franklin? For the “Honors-Palooza”, I was thinking that we could go with the proposed idea of having a timeline of important events in Benjamin’s Franklin’s life (this would include occurrences that shaped him into the man that we know today and innovations that he created over time). These events would be split up into different areas around the room and we would turn what we learned into a “tour” of some sort for the visitors to take part in. I think that we should stick with the idea of having David (or whoever else volunteers) dress up as Franklin. However, I think that he should act as a “tour guide” and bring the visitors to each area (for lack of better word). 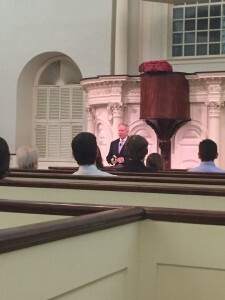 Each area would be introduced by the “tour guide” and there would be students that have prepared a few words to say about or images of their specific occurrence/event in Franklin’s life at each area. Once completed with the “tour”, we could possibly have some things that would be available to sell that could go toward funding the history department? Or we could even have small tokens of thanks instead that they could receive as they walk out of the room (such as a fake $100 bill or bar of soap as mentioned by some of our classmates prior). I think that interacting with our visitors is key and something that we should definitely do in order to keep them intrigued and interested! Quoting Franklin: Real or Fake? 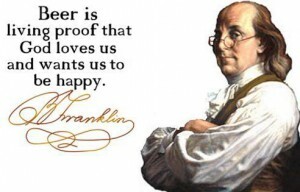 It is often that Benjamin Franklin is credited for saying the following phrase: “Beer is living proof that God loves us and wants us to be happy.” However, after partaking in some research on this quote, I found that he never actually spoke those words. In 1779, Franklin wrote a letter to André Morellet in the French language that referenced the wondrous creations of nature by God. Below is his quote translated into English language. I would definitely say that the quote many of see today was misinterpreted. How they got “beer” out of that quote is pretty questionable and the reason as to why it was changed to that is quite unclear. It was probably someone who was either a maker or seller of beer and in order to bring attention and desire to their product, the quote was turned around in their benefit. So to all of the beer lovers out there: this quote may be true to you, but it was not to Benjamin Franklin (he supposedly liked wine better, anyway). Posted on March 22, 2016 March 22, 2016 Author brianadamelioLeave a comment on Quoting Franklin: Real or Fake? 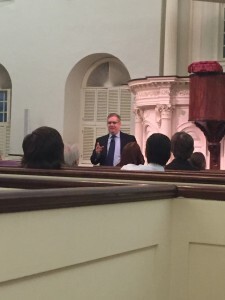 Tonight, I had the honor of attending the “Fifth of March (Boston Massacre) Orations” at the Old South Meeting House. When I first heard about the opportunity to attend, I decided that it may be a good idea to see what it was all about. I knew that it was going to be informative, but what I did not know was that I would be exposed to so many diverse people. These people were all different in their own way but had one thing in common- their interest and acknowledgment of a specific past occurrence which just so happened to be the Boston Massacre. 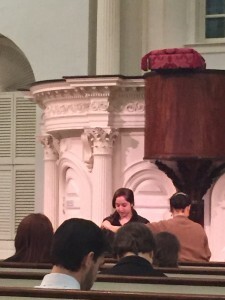 Walking into the Old South Meeting House, I was eager for the activities of the night to begin. I observed my surroundings and and waiting for what would happen next. To begin, a woman introduced herself and gave us a run down of what we would hear. Not too long after she spoke. we were introduced to the two “hosts” (for lack of better term) of the night: Robert Allison (Hi Professor Allison!!!) and Sam Foreman. They were briefly introduced and the orations began. 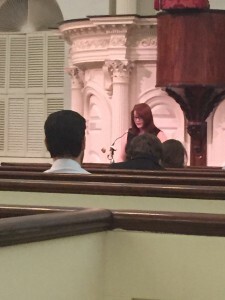 Professor Allison gave the crowd a background of the first set of orations that were going to be read. This set was from the Boston Massacre Orations of 1772-1774 and included speeches from Dr. Joseph Warren, Dr. Benjamin Church and John Hancock. 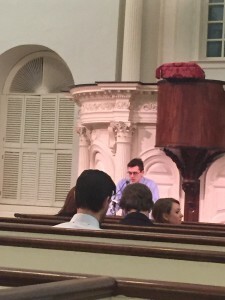 Most of the speeches were read in portions by different people, including our own Caroline and Brendan.. There was a short break and then we moved forward to the Boston Massacre Orations of 1775, which was introduced by Sam Foreman (in his best Dr. Joseph Warren attire). 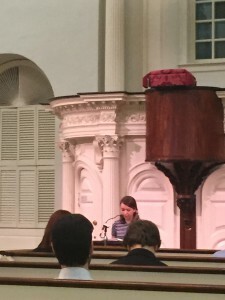 Once again, the speeches by Dr. Joseph Warren were read in pieces and this time we got to hear from a different group of people, this time including our classmates Rachel and Marissa. I really enjoyed the experience and being able to observe such a wonderful event! Below, I have included pictures of our awesome classmates, Professor Allsion and Sam Foreman. In pursuit of figuring out a new “particular Phaenomena”, Benjamin Franklin set forth in his efforts in experimenting with what we know today as electricity. He wrote each of his steps down in a lengthy letter to Peter Collinson and explained why he was doing the specific things that he was. As a class, we were allowed to do the same, in a quite simpler way. Professor Allison provided us with the materials that we needed, including balloons, wool cloths, tin foil, card board and wires. We then began to mimic the experiment on our own, rubbing pieces of wool cloth all over the balloons for minutes at a time and hoping that we would be generating some sort of electricity while we did so. To measure our success (or failure), we quickly constructed testers by cutting out a piece of cardboard, taping a short wire to it and wrapping the end of the wire with tin foil. After this was completed, we put this contraption close to the “charged up” balloons and looked to see if there was an electrical pull. My experiment ended up being successful in the end as I noticed that there was a pretty large pull toward the contraption when it was near my balloon. The balloon that I used was relatively small (much smaller than almost everyone else’s) so I think that it was a lot easier for it to become charged up with electricity in a timely manner. Benjamin Franklin wrote a satircal piece under the pseudonym Historicus. It is a response to a speech given by Georgia Representative James Jackson, who was pro-slavery. To mock Jackson’s speech, Franklin created a fictional character who was the leader of Algiers named Sidi Mehmet Ibrahim, who “gave” a speech 100 years prior. In the fictional speech given, Ibrahim states that he was “against granting the Petition of the Sect, called Erika.” The Erika were purist who wanted to abolish slavery because they found it to be unjust. Ibrahim’s fictional speech questioned the Erika as to why they wanted their petition to be accepted. These questions included “Who will cultivate the lands?” and “Who will perform common labors in the city and in the family?” He also says that if the petition were to pass, the land will become of no value for want of cultivation, rents of houses will be reduced by one half, revenues of government arising from its share of Prizes would be reduced, slaves would be set free and they would not convert and embrace Christianity. Because of Franklin’s opposition against slavery, he was named President of the Pennsylvannia Society for Promoting the Abolition of Slavery. In this role, he petitioned to promote the abolition of slavery which prompted Jackson to make his speech that focused on aspects of pro-slavery. Both petitions were ultimately not granted and slavery was not abolished at this time. On March 23, 1790, Benjamin Franklin, under the pseudonym of Historicus, responds to a speech given by Georgia Representative James Jackson. This speech mirrored one spoken 100 years prior by the Islamic leader of Algiers Sidi Mehmet Ibrahim. Quoting Ibrahim’s speech showed that Jackson’s views on slavery were immensely similar to that of the Islamic leader. The speech shines light on what are considered to be “positive” aspects of slavery thus including what a slave is supposed to do after they are set free and what they believe the point of slavery is- to convert those in captivity to their preferred religion. The goal of Franklin in responding to this speech was to mock Ibrahim and Jackson in the ideal that slavery could be considered a “good” thing. Being the President of the Pennsylvania Society for Promoting the Abolition of Slavery, Franklin was obligied to go against slavery and make others aware that the abolition of it could be possible. His reasoning for not blatantly coming out and saying “slavery is wrong” was to not dictate anyones ways of thinking and allow all those who followed to form their own opinions. It is important to note that this was the last piece of work written by Benjamin Franklin due to his death just three weeks later. On the 13th of April in 1722, the third essay of Silence Dogood (the female alias of Benjamin Franklin) was written and submitted to be published in the New-England Courant. This beginning of the essay was written in a manner that acknowledged the fact that service to a country can be offered by all- whether it is accomplished in a physical way or intellectually. Dogood makes it known that “her [own] way” of service comes through her writing, especially her work moving forward in the New-England Courant publication, saying “I have from my Youth been indefatigably studious to gain and treasure up in my mind all useful and desireable knowledge… As I have found it very beneficial to me, I am not without Hopes, that communicating my small stalk in this manner [to the public] may be at least in some Measure useful”. In continuance, it is evident that her intellectual contribution is likely to be controversial (especially due to the fact that she is including her own topics and own opinions). She recognizes that she will not get the chance to be able to please each person who reads her essays, however she remains steadfast in her mission to try to discuss, incorporate and combine as many themes as she possibly can, hoping that at least one person at one time or another will be intrigued with or convinced by her works; Undoubtably, that is a tough feat. With this, she intends to be the a “foundation” of citizen empowerment and wishes that the readers of her publications will build upon her actions and contribute to their country in any way that they can, remembering that no matter what their efforts will be recognized and appreciated. Before concluding this essay, she gives the reader her word the she is speaking out from her heart and will continue to do so throughout the rest of her essay writing. She ends this particular essay having nothing left to say, however the significant impact that she is already beginning to make early on in her essay writing speaks many words, in itself. 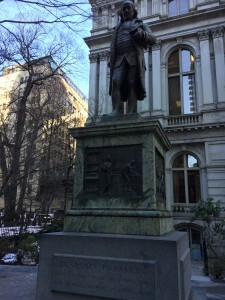 When walking through the streets of Downtown Boston, it is likely that you will come across a monument/statue that is dedicated to BENJAMIN FRANKLIN- one of the Founding Fathers of the United States and one of the most influential and intelligent men throughout American history. 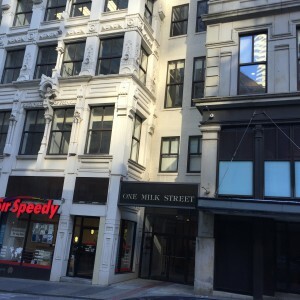 Benjamin Franklin, the son of Josiah Franklin and Abiah Folger, was born on January 17, 1706 at One Milk Street in Boston, Massachusetts (Pictured Above). This building, however, is not the precise location in which Franklin was born due to the fact that the original building burned down in a major fire in back in 1811. One the second story of the modernized building, a carving of Franklin’s bust is able to be seen. Underneath this carving reads “Birthplace of Benjamin Franklin”; this allows all who see to remember the significance of One Milk Street. When the modernized building was built, it just so happened to also be the location of “Sir Speedy”. “Sir Speedy” is a print shop. That is quite ironic due to the fact that Franklin worked in (as well as gained skill and success in) a printing press as a teenager as an apprentice to his elder brother. The significance of this building is immense and though he did not live there his entire life (he later ventured off to Philadelphia) – it was where he began. The Granary Burial Grounds, located on Tremont Street, is the resting place/ gravesite/monument that is dedicated to the parents of Benjamin Franklin- Josiah Franklin and Abiah Folger. 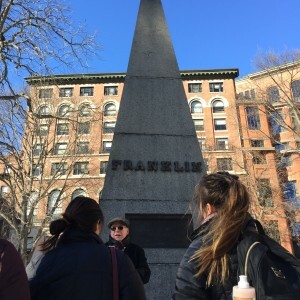 Pictured above is the renovated “obelisk” (a skinny pyramid-shaped monument) that was constructed by citizens of Boston in 1827 after the original gravestones, that were constructed by Benjamin Franklin, himself, had succumbed to natural ware and tear. When obelisk was erected, an inscription that referenced the lives of Josiah and Abiah, in quick and influential summary, along with the birth/death dates. Benjamin Franklin is not buried here, however a few of his siblings were laid to rest with their parents here. The Granary Burial Grounds is also home to Samuel Adams, Crispus Attucks, James Otis, John Hancock and Paul Revere. Had Benjamin been buried there, instead of in Philadelphia (where many of his successes took place)- he would have definitely been in great company being laid to rest alongside many other influential Americans. This full body statue/monument of Benjamin Franklin is located at the Old City Hall, which is now home to Ruth’s Chris Steakhouse on School Street. This is one of the most iconic statues in the city of Boston and it just so happens to be one of my favorites. Constructed in 1856, each part of the statue has its own significance. Underneath the full body statue is a square-shaped monument; this piece of the square monument has pictures engraved on all four sides. One side has a photograph of him working with electricity and there is a latin script below it, on another side, he is pictured signing the Declaration of Independence along with others who signed it as well, there then is a picture of him working in a printing press and lastly there is a photograph of his working on the Treaty of Paris. Benjamin Franklin was man of many skills and much intelligence. He is one to be remembered and all of these these monuments are the perfect way to remember him by.